Canmore bed and breakfast travel guide for romantic, historic and adventure b&b's. 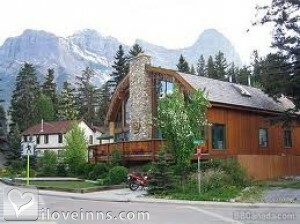 Browse through the iLoveInns.com database of Canmore, Alberta bed and breakfasts and country inns to find detailed listings that include room rates, special deals and area activities. You can click on the 'check rates and availability' button to contact the innkeeper. Canmore, Alberta provides a great view of the Canadian Rocky Mountains. Banff National Park and Jasper National Park are wonderful spots. The best way to tour the area is by signing up for a Yamnuska Mountain Adventure, a popular tour in the area. Fishing is another favorite activity in Canmore and to enjoy this, Banff Fishing Unlimited is the recommended guide. Fishing spots here are Lake Minnewanka and Lake Trout. In winter, ice fishing is popular at Spray Lakes. Spray Valley is the most popular winter destination in the Canmore area. From their Canmore bed and breakfast inns, guests can head out to art galleries nearby, such as Avens Gallery, Elevation 1309, and Kinsella Art Studio Gallery. By Ambleside Lodge.